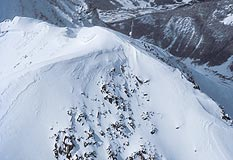 During the winter of 1991-92, a Campbell Scientific weather station provided important avalanche forecasting information for the Ten Mile Canyon area in Colorado. Workers planned to bury a fiber-optic cable in the canyon and would be exposed to avalanche danger in many locations along the route. The weather station, located near the summit of Ten Mile Peak, reported weather conditions via radio telemetry. Each morning avalanche forecasters helped coordinate work activities so that dangerous areas could be avoided.